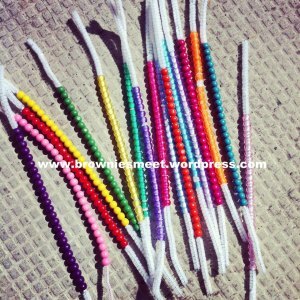 Opening activity – make beaded friendship bracelet. 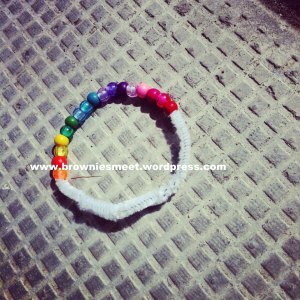 (Each girl will receive a different bead on a pipe cleaner and an empty pipe cleaner. The girls need to collect one of each of the different beads and put them on her pipe cleaner. When she asks for the bead she must introduce herself and find out what her new friend’s name is. 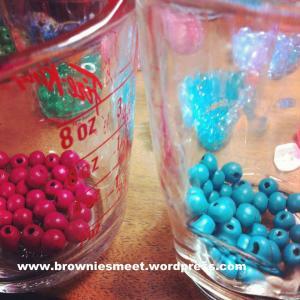 This is not a 10 minute prep thing… plan to sort your pony beads well in advance. By Cara Hicks – Community Guider, Brown Owl and Blogger. This was originally posted to Cara Hick’s blog Brownie Meeting Ideas. Read previous posts written by Cara on GirlGuidesCANBlog: Simple Flag Ceremonies, Junior Leaders: How to Make the Best Use of Their Generosity?, What I Would Tell a New Guider, Online Resources: Guiding in the Cloud, and Getting Started: What to do About Badges. 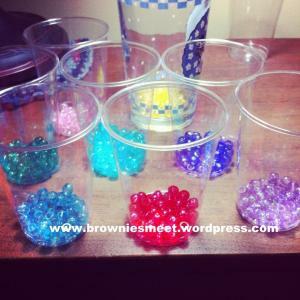 This entry was posted in Awesome Activities and tagged brownies, crafts. Bookmark the permalink. The pipe cleaners are cute! In the past I’ve used 1mm elastic cord, with a ‘stopper’ bead tied on one end to prevent the other beads from falling off. I like this method because the elastic cord makes it easy to get the bracelet on and off, but difficult for it to fall off on its own. But I like the pipe cleaners because I think there would be a lot fewer incidences of the younger girls losing their beads. you as well as it does not always come naturally! Another really cool idea I learned at a training I went to last year is using pieces of fabric to make bracelets.